A chilly Halloween awaits the Finger Lakes today as cool air continues to flow into the region behind Sunday’s large storm system. While that system is far to the north in Canada, it continues to provide a steady stream of cold air and gusty winds across the Finger Lakes. The cold air over the warm waters of the Great Lakes is producing areas of lake effect rain showers and a few higher elevation flurries. This morning, these are focused across the northern Finger Lakes off of Lake Erie and will wobble around throughout the day. 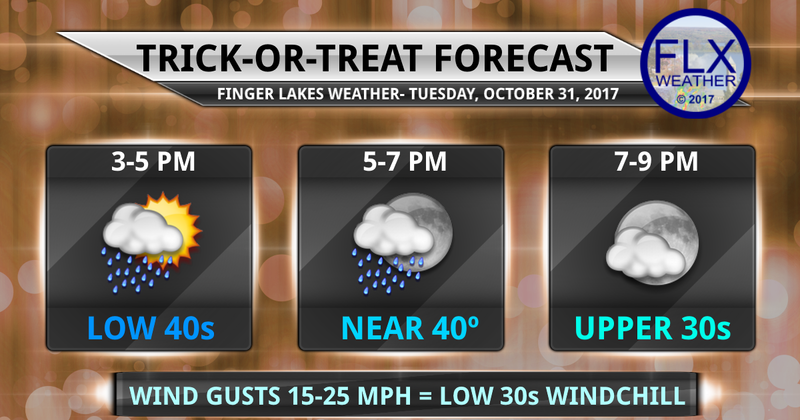 Late this afternoon, the lake effect will start to dissipate as winds become less aligned off of Lake Erie. By this evening, most of the area should be dry. Temperatures will top out in the mid 40s this afternoon before starting to drop after school lets out and afternoon trick-or-treating commences. Temperatures tonight will mostly be in the 30s. With winds gusting over 20 mph at times, it will feel a few degrees even cooler. Don’t forget to account for the wind when heading out this afternoon and evening!